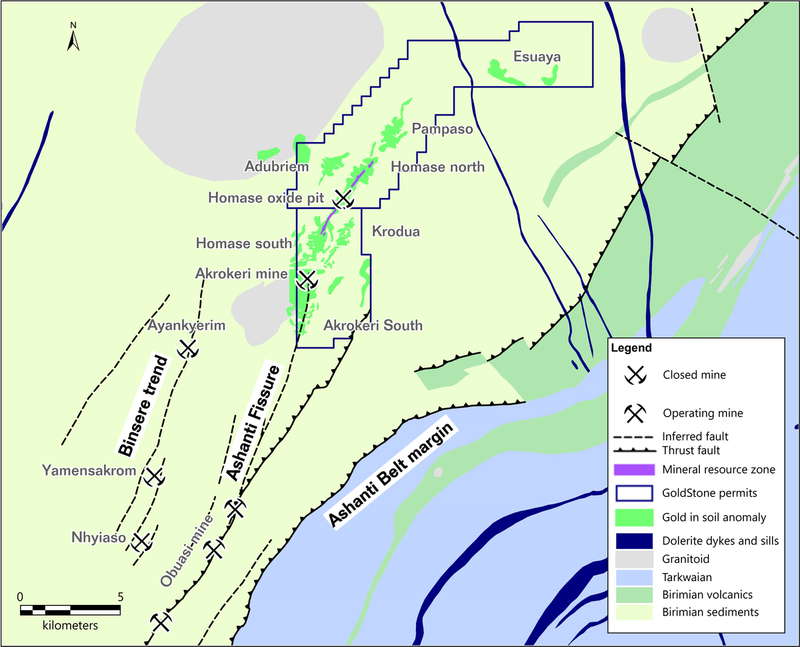 GoldStone holds a 90% interest in the Homase Licence. 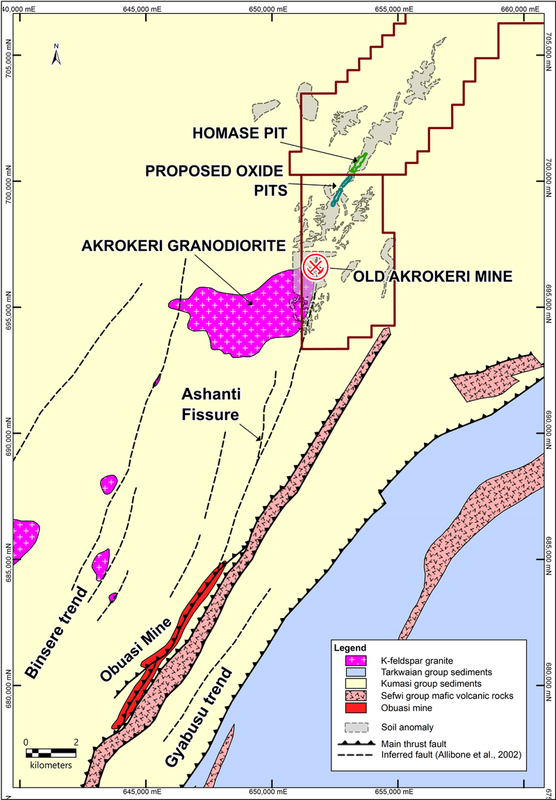 The Homase Open Pit is located approximately 12km along strike from AngloGold Ashanti’s Obuasi Mine which has a total historical and current resource in excess of 70M oz Au. 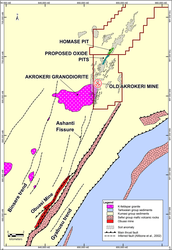 Homase previously produced 52,000 oz Au from one open pit at a final recovered average grade of 2.5g/t. GoldStone’s work has defined initial JORC compliant resources of 602,000 oz Au at 1.77 g/t from southern and northern extensions which could be heap leached or toll treated in the near future. 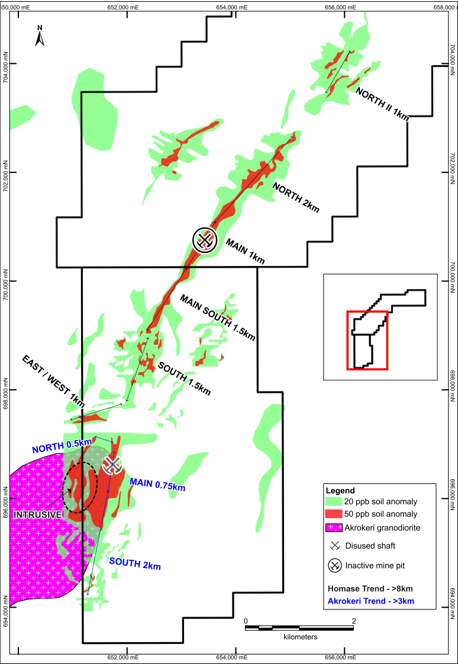 Historic trenching indicates high grade gold mineralisation, including 15.0 metres @ 6.31 g/t Au which includes 4.5 metres @ 18.23 g/t Au from a trench in the Homase North Resource Zone. 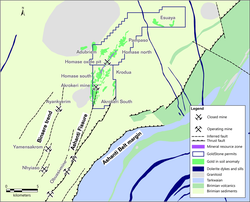 GoldStone’s recent soil geochem programme coupled with the review of historical data has identified a >8km gold-in-soil anomaly, the Homase Trend. 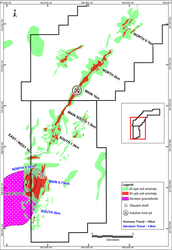 This extends both to south and north of the pit and contains the 4km resource zone which remains open at depth and along strike.